Let others feel happy as you deliver them this Memorable Moments 50 Dutch Roses Premium Bouquet with your love and affection. This Bouquet of Roses is beautifully hand-arranged with Filler Flowers and packed in a matching Tissue and tied with a Ribbon. Amaze your loved ones by gifting them this Lovely Premium Bouquet of 75 Dutch Roses and make them crave for more. This Bouquet of Dutch Roses is filled with Filler Flowers and nicely wrapped in a matching Tissue and tied with a Ribbon. Amaze your loved ones by gifting them this Lovely Premium Bouquet of 90 Dutch Roses and make them crave for more. This Bouquet of Dutch Roses is filled with Filler Flowers and nicely wrapped in a matching Tissue and tied with a Ribbon. 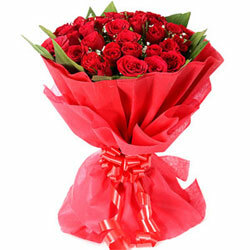 Amaze your loved ones by gifting them this Lovely Premium Bouquet of 100 Dutch Roses and make them crave for more. This Bouquet of Dutch Roses is filled with Filler Flowers and nicely wrapped in a matching Tissue and tied with a Ribbon.